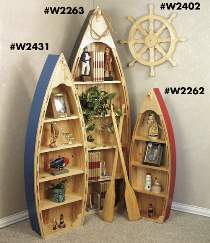 Our boat shelf project plans are available in a large, medium and small version. You’ll find them all exceptionally easy to build. Most parts including the bottom are drawn FULL SIZE for easy transfer to your wood. Projects are made from pine beaded board, 1/4" plywood and some 3/4" stock. Pattern for oars is included with the large boat plan. Small boat measures approximately 43"H x 16"W x 5-1/2"D. Medium boat measures 58"H x 20"W x 8"D. Large boat measures 73"H x 25"W x 8"D. 24" Ships Wheel can be made entirely from 3/4" stock, makes an excellent decoration to go with the boat shelves. The #W2432 Nautical Special includes all four plans!